THINKING OF BEING INVOLVED IN DEVELOPING PROPERTY? DON’T HAVE THE TIME, KNOWLEDGE, INCOME or CONFIDENCE? TIRED OF RECEIVING 2-3% IN THE BANK? HERE’S YOUR CHANCE TO BE A PART OF DEVELOPING PROPERTY AND EARN 12, 13, 14 OR EVEN 15% PER YEAR! Citify and Bert Farina Constructions have launched Adelaide Building Capital. Run by Co-Directors Anthony Farina and Joel Wilkinson and with Oreon Partners as the company’s advisor and auditors. We all know that Adelaide is a great place to live and we invite you to join a community that is passionate about developing South Australia’s future. WHAT WILL ADELAIDE BUILDING CAPITAL DO? Our purpose is to invest into South Australian building and development projects by value adding and transforming underutilised land into apartments, townhouses, commercial property or subdivided lots. WANT TO SEE HOW MUCH MONEY ONE OF THESE 1, 2, 3 OR 5 YEAR INVESTMENTS WILL PUT BACK IN YOUR POCKET? To secure your investment, please express your interest to anthony Farina. IT’S YOUR MONEY, INVEST WISELY. Development is any process that adds value to a property by maximising the potential of the land to generate profits, which in turn delivers the attractive returns being offered. How do you minimise risk in larger projects so that I know my investment is secure? Choosing development sites that have a high demand of buyer enquiry. Working with the best consultants and companies in the industry. Managing the process from acquisition, through design phase, to improving the value and selling completed units or homes for at or below retail price. Financing 65-70% of the required debt at low interest rates with major banks. Designing and constructing the buildings to ensure efficiencies of design and quantities of scale. 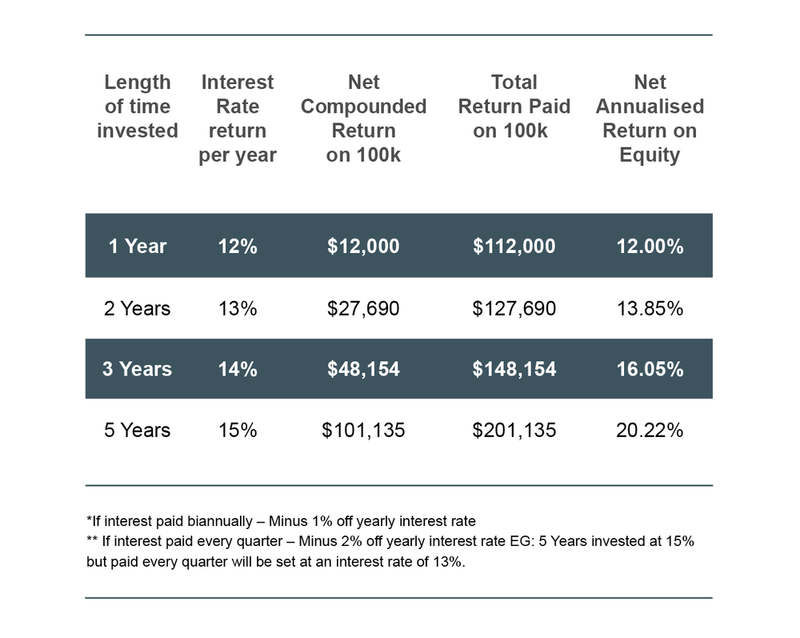 Why do I earn a higher percentage for investing for longer? Your investment will be allocated to one or more projects that have certain timeframes till completion; only look to invest what you desire for the next 1 to 5 years. What if I need to withdraw my money out sooner? You can choose to receive regular quarterly interest-only payments at a slightly lower rate with the balance of the loan paid at the end of the loan term if you desire. Is a longer timeframe than 3 years available at an even higher rate? The highest offer will be 15% over 5 years paid yearly or compounded and paid at the end of the loan term. This will only be offered to select individuals/companies as determined by Adelaide Building Capital. What documentation is required to be completed? What if I want to build assets instead of cashflow? Depending on the level of investment you may convert your income earnings to act as the deposit on a new investment property in one of Citify and BFC’s development projects. What if a project takes longer to finish than you expect? How much does it cost for the loan agreement? The loan agreement documentation has already been drawn up and documented by WRP Legal. These costs are borne by Adelaide Building Capital. How do I know how much will be returned to me at the end of the loan term? Your legal loan contract will detail the loan agreement terms, including loan term length, interest rate, if compounded yearly or paid annually. Is the income I earn taxable? Please talk to your accountant surrounding your investment earnings as everyone’s taxation situation is different. Who looks after the accounting? The accounting is first recorded by a bookkeeper and then audited/checked by Oreon Partners. Do you invest into each development? We co-invest into each one of our developments as well as putting in the thousands of hours to bring these developments into reality. Can I invest using an equity redraw or line of credit? You can if your trust deed allows it. I don't have a Self-Managed Super Fund (SMSF). How do I set up a SMSF? Speak to a Financial Planner or Lawyer who can set up a Superfund Trust. A typical super balance for setup of SMSF is over 200K. You will have to speak directly with your financial adviser about your investment strategy if considering setting up a SMSF with a balance of less than 200K. There are initial setup costs of approximately $2000-$3000 and ongoing yearly audit costs. If you have any other questions or want to have a meeting to discuss further, please contact Anthony Farina at your convenience.